Great news for Next Generation fans! Bad news for Next Generation fans who have already shelled out upwards of $300 on TNG DVDs because we’ve been told for years that the series would never be released on Blu-ray! 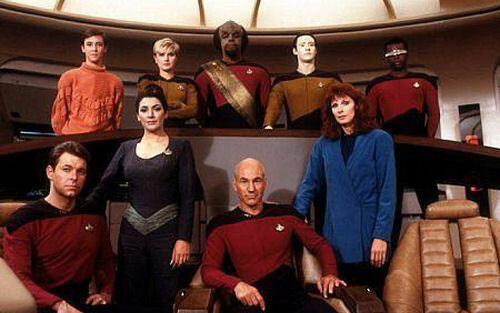 Star Trek: The Next Generation is coming to Blu-ray. Yay/Boo! Bill Hunt at The Digital Bits broke the story earlier this week that Paramount will be releasing a four episode “sampler” Blu-ray later this year, containing the episodes “Encounter at Far Point, Parts 1 & 2,” “The Inner Light” and “Sins of the Father.” How those four shows were chosen, I cannot speculate, as there is yet to be an official announcement. Maybe we’ll know more when that happens. Apparently, all of the effects shots on Next Generation were done on video, making it difficult to do a traditional remastering. It sounds like Paramount may consider shelling out for a complete overhaul of the episodes (like they did with the DVD releases of The Original Series when those got remastered a few years back) depending on how this sampler disc sells. I don’t blame them for testing the waters first, but I’m not sure why someone would buy a disc of four (basically) unrelated episodes. Best case scenario, the whole series comes out on Blu-ray and that person has to buy those episodes again. Worst case scenario, these are the only four shows that ever get an HD upgrade, and then you have four random episodes of Next Generation sitting on your Blu-ray shelf — in which case, I don’t know how you sleep at night. As anyone reading this knows (no one is reading this), I have yet to start watching The Next Generation (everyone read Boldly Going! ), but I do already own the series on DVD. I have a very special relationship with my DVDs of that show — there’s a rather touching story attached to them — so I won’t be making the upgrade, but I’m happy for anyone who has been holding out in the hopes this day would come. It would be great if this wasn’t just a one-off experiment, and the entirety of Next Generation is made available on the best possible format. Thanks to Hercules at Ain’t It Cool for the heads up.